Fort Miller and Fort Edward sit aside the historic Champlain canal which connects the Hudson River with Lake Champlain. Location. 43° 9.645′ N, 73° 34.658′ W. Marker is in Fort Edward, New York, in Washington County. Marker is at the intersection of Lakes to Locks Passage (U.S. 4) and Fort Miller Road, on the right when traveling south on Lakes to Locks Passage. Touch for map. Marker is in this post office area: Fort Edward NY 12828, United States of America. Touch for directions. Other nearby markers. At least 8 other markers are within 3 miles of this marker, measured as the crow flies. 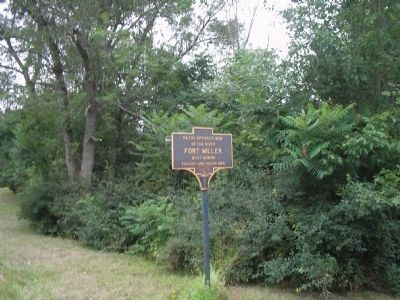 Gen. Henry Knox Trail (within shouting distance of this marker); Duer House (approx. 0.2 miles away); Judge William Duer (approx. half a mile away); Gen. Washington (approx. 1.2 miles away); World War I and II and Korean Conflict Memorial (approx. 2½ miles away); Gen. Schuyler's Intrenchments (approx. 2½ miles away); Captain Furnival's Battery (approx. 2.9 miles away); a different marker also named Gen. Henry Knox Trail (approx. 2.9 miles away). Touch for a list and map of all markers in Fort Edward. 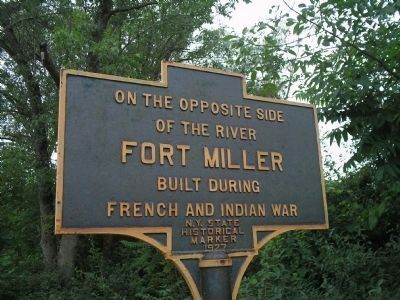 The defensive fortifications known as Fort Miller were constructed on the west side of the Hudson River in the southern end of the town of Fort Edward. It was built during the French and Indian War and was named in honor of the builder, Colonel Miller. More. Search the internet for Fort Miller. Credits. This page was last revised on January 30, 2017. This page originally submitted on July 18, 2008, by Bill Coughlin of North Arlington, New Jersey. This page has been viewed 1,288 times since then and 9 times this year. Photos: 1, 2. submitted on July 18, 2008, by Bill Coughlin of North Arlington, New Jersey.